Houzz 238 of our visitors have told a friend about this plan. 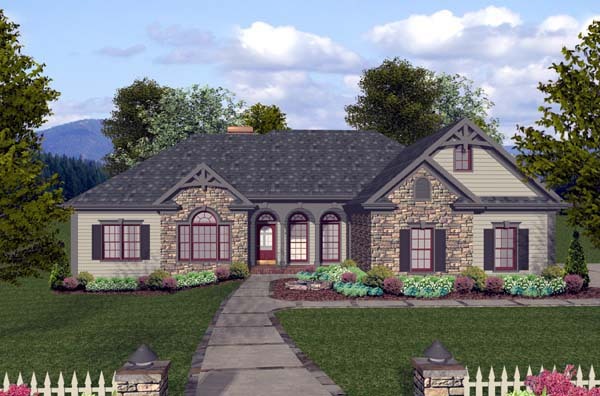 We've integrated our customer's most requested features into a mid-sized ranch in the creation of this attractive new design. 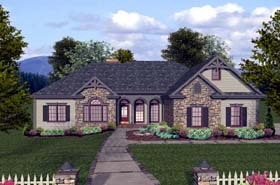 The Craftsman style siding and stone exterior is accented with a "Palladian" window, multi-level trim and an inviting front porch. A flex room, an exquisite master suite, a 3-car garage, and a large screened porch are sure to make this 2000 square foot home irresistible. Question: I see that the plans are drawn to IRC 2012. Upon Purchase, will you update the plans to IRC 2015. If I choose to put brick where the siding is, will that require a change to the foundation for a brick ledge? Do schematic electrical plans come with this plan? Question: 1. If you have a gas furnace and gas fireplace, is there enough space in that chimney to run both chimney vents? 2. The wall between the living room and the kitchen counter-is that a load-bearing wall? 3. If I'm not going to have a bonus room, can the bonus room staircase be replaced with the basement staircase by the builder? Answer: Yes, there should be room to run both the fireplace and furnace flue in the chase. Yes, the wall between the living and kitchen is load bearing. Yes, a competent builder should be able to redline the plans to make the bonus stairs the basement stairs. Question: If I purchase the CADD file. Are there any stipulations I need to be aware of. I should be able to print as many copies as I want as well as any size and also make design changes correct? Answer: No restrictions except resale is prohibited – even with a modified version. Question: I ordered the plans already but I’m hoping there are suggested locations for skylights. Also. If you have any pictures of this home (already built). U would appreciate ideas for the coffee corner (I know what I would like but am open to ideas). Finally, is the wall between the flex room and bedroom a support wall? I would like to add a sliding shelf door between those rooms so basically I will need to ask my builder to cut out a hole in that wall. Answer: Should consult the builder with skylight locations. It is also dependent on what you want for natural light and where. I regret we do not have any pictures available for this design from past customers. Wall between the flex room and bedroom is load bearing. So opening would simply need a header. Question: In my search for floor plans I requested ADA. Does this qualify as ADA? Answer: No this design doesn’t qualify as ADA. Design will need to expand some for 3-0 doors, and the bathrooms need significant expansion for the typical 5ft diameter clearance in bathroom. Question: Is the garage dimension of 34' 2" from the front wall to the basement stairs or to the master bathroom wall? Question: Is the 500 sq ft bonus room a heated space? The rear view is hard to tell if the 10'1"x10'11" deck is covered? Answer: Deck is not covered. Bonus room is not part of the 2000 sq.ft. total living area. Question: Is this house IRC2009 compliant? If not, what would it take to make it compliant? In Pennsylvania, all new construction since 2016 must comply with IRC 2009. Is there a way to search for only those plans? Answer: Plans are done for 2012 IRC. Question: Is this plan 2009 IRC compliant and stamped as being 2009 IRC compliant? Answer: Not sure what is meant by stamped for 2009 IRC code, but the specifications sheets for this design included are for the 2012 IRC. Question: Where are the hot water heater and the furnace located in this plan. Answer: Basement if basement option is chosen. Either garage or attic if slab or crawl space. Question: What is the drawing time on the 2x6 walls and the basement foundation? Answer: No lead time required. Question: It appears access to the basement would be through the garage. If no bonus room is constructed, could access to the basement change from the garage to inside the house where the plans show stairs up to the bonus room? Answer: Yes, scenario described could be a possibility. Question: are all the ceiling heights in each room 9' high? Answer: 9ft is the main clg hght. Front office, family room, and master bedroom have vaulted clgs that go higher. Question: How much of the bonus room is at full ceiling height? Answer: About a 4ft section down the center is at full clg hght. Question: If finished basement plans are added, what is the basement square footage and what area of this floor plan has basement under it? Answer: The basement option is an unfinished basement. Basement follows the same outline as the living area above. Subsequently, if finished, it would be basically the same sq.ft. as the main level. Answer: LVL beams indicated on plans and ML. Plans are up to 2012 IRC. Question: This house plan came up when I typed in 3 bedroom house with garage tall enough for an RV. How tall is the clearance of the bays in the garage? Answer: Not sure why this came up with an RV garage search. But the garage doors are 7ft high. Question: What is the ceiling height of bonus room in middle and sides? Answer: 8ft down the center and 4’-6” knee walls. Question: If plans are purchased, do they expire? We want to start building in 2 years. We want to find the house we want, buy the plans then focus on that as our goal. Look forward to hearing from you. Answer: Thank you for your questions. The licensing to build does not expire. For all modifications, please contact our modifications department at 800-482-0464 ex. 410. Question: Can you tell me the demensions of the closets and baths in bedroom suites 2 and 3? Question: What style of architecture would this house be? Question: 1. Is this floorplan in a house that we could travel to in order to walk through (we are willing to fly to where it is) ?We need to sense the feeling of spaciousness to make sure there is enough space in each room. We love the floorplan on paper (Bird's eye view). Answer: I regret that we do not keep records of where the designs are built. Question: Family room dimensions state 16 x 21...does the 21ft. go from flex room to back wall or from front door to back wall? Answer: Measurement is from the flex room wall to the back wall of the family room. Question: Is the exterior wall and material included in the 2000 sq ft? If not, what would the total be? Answer: Yes, the exterior wall thickness is included in the sq.ft. tabulation. Question: I'm not a big fan of arches, is there a design without arches in this floor plan? Answer: All the plans in this bracket that all are derivatives of each other have arches. That said, client can easily have their contractor square things up in the field. Question: can this house have an all brick exterior? Answer: Yes, brick can be added. Your builder/contractor could possibly just add the brick ledge in the field. Question: Can this kind of plans have red tile roof? Answer: Yes, they can use clay tile. They typical would need to increase the rafter size by one size. Furthermore, increase all the ridge and valley beams one size up – and change them to LVL’s. Answer: Plans are to 2009 IRC. 2x6 is available for all plans for $250.00. The website already shows the rear view. There is no walkout basement option available. However, the standard basement is available for the $150.00 shown on the website. Material list is available for the $85.00 shown on the website. No cost to build information is available. Question: What is the roof line height in the loft above the garage sides and middle please. Click Here to download a free PDF Brouchure of Plan Number 74812.